The Journey to Mt. Kailash is mainly we take by driving from Kathmandu to Nyalam. Alternatives are trekking through Simikot(far west Nepal) into Hilsa or out of Lhasa where flights from Kathmandu are available. Best Nepal Trekking offers unique fixed departure excursions to Mt. Kailash & Lake Manasarovar to facilitate pilgrims & foreign tourists. We are probably one of the few outfits that provide Nepali Sherpa staff support for all our treks in Tibet in order to make sure similar high-quality trek services which exist in Nepal. All excursions are planned to arrive at Kailash/Manasarovar on a full-moon day to acquire the complete & unhindered view of this holy mountain. Mt. Kailash (6714m) lies in the far western portion of the vast Tibetan Plateau. Mt. Kailash is a sacred place to the Buddhist, Jain, Hindu and also the Bonpo religions. For the Hindus, the mountain represents the abode of Lord Shiva; to its Buddhists (Kang Rinpoche) a prized jewel of snows. The Wheel of Life; for its Bonpos and also for Jains Kailash is called Astapada. We travel over vast Tibetan plateau by Landcruiser or deluxe buses that takes five days to get there in Darchen at an altitude of 4750m. Walking around the holy Mt. 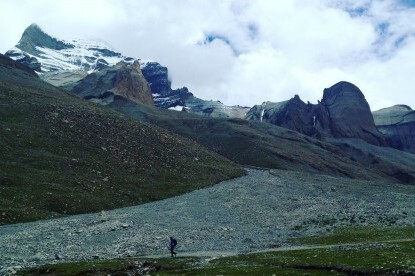 Kailash will be done on foot which takes three days of trekking starting from Darpoche to cross the Drolma pass (5630m) descending all the way to Zutulphuk then next day to Jongdu where we fulfill with the vehicles. Four of the wonderful rivers of south Asia originates from here: the Karnali, which goes into the Ganges(south), the Indus (north), the Sutlej (west) and also the Brahmaputra (Yarlung Tsangpo) to the east. Mt. Kailash pilgrimage tour is quite special for every single human being and it is once in a lifetime chance to become experienced. All airport transfers (Pick up and drop) by private vehicles. Twin sharing accommodation 3 nights at 3 star Deluxe Hotel in Kathmandu on full board basis. Land transportations from Kathmandu to Kodari - Kathmandu by tourist coach. Best available hotel accommodation during the trip, Guesthouse as well in Parikrama as mentioned in the itinerary. All kind of freshly cooked vegetarian meals (breakfast, lunch, dinner) and all kind of hot drinks (tea/coffee/ hot water) during the trip from our kitchen, bottled drinking mineral water. Tibet entry visa, travel permits and all entrance fees to Lake Manasarovar, Mt. Kailash, Shisapangma conservation area and Saga grass land area fees. Transportation in Tibet by 4500 Model Toyota Land cruisers (04 person in each) or Van (5-6 person in each) As per the new rules in 2014, land cruiser may not allowed in Kailash but so far not finalized. Supporting trucks for luggages, food supplies and cooking staff. English speaking Tibetan guide for the trip. Insurance for Nepalese staff and Tibet Alien Travel Charges. Yaks and Yak men to carry our supplies during the Parikrama. Oxygen and Gamow bag (high altitude chamber) for emergency. Sightseeing in Kathmandu valley into 3 different sites (Pasupatinath temple, Boudhanath stupa and Budhanilkantha temple), transportations and entrance fees. Air ticket to / from your country. Extra porter & transportation charges in the event of road blockades or landslides. 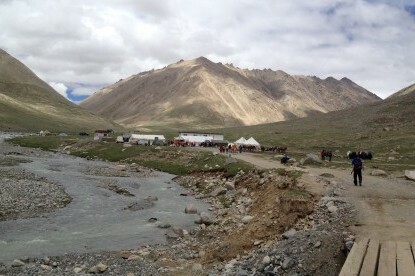 Personal horses to riding and porters during Parikrama. We will receive you at the airport and then transfer to the hotel. Trip briefing in the evening. Overnight in Hotel with full board basis. Day 02 Half day sightseeing in Kathmandu valley 03 different sites. Half day sightseeing in Kathmandu valley 03 different sites as Pashupatinath temple, Boudhanath stupa and Budha nil kantha Temple), Visa preparation day. Free afternoon. Overnight at Hotel with full board basis. Depart at early from Hotel in Kathmandu and drive to Kodari, Nepal Tibet border (115 KM). After immigration and customs Formalities on both sides we drive to the town of Nyalam (45KM). Overnight stay at Hotel. To facilitate altitude acclimatization we will take you on a day hike for few hours and return back to the same hotel. All meals and overnight stay at Nyalam same Hotel. We start driving after breakfast, following the Bhotekoshi River. Once we get higher at Lalung la pass (5050m) the view of Mt. Shishapangma (8012m), Gauri Shanker and other many high mountains can be seen. Then we leave the main highway and drive to west by Peiku Tso Lake. Packed lunch will be served at the bank of Brahma Putra River. Then continue driving to new Dongba for another 2 hrs and overnight stay at Guesthouse. After breakfast we drive along the Brahmaputra River across the vast Tibetan plateau of Paryang. We cross the check point to be checked passports at Mayum La. Today we drive over 5211M high Mayumla pass. On the day time we can see good view of border Himalaya of Nepal including Mt. Kanjiroba and chances to encounter many wild animals. The auspicious day for all travelers having first glimpse of the Holy Manas and Mt. 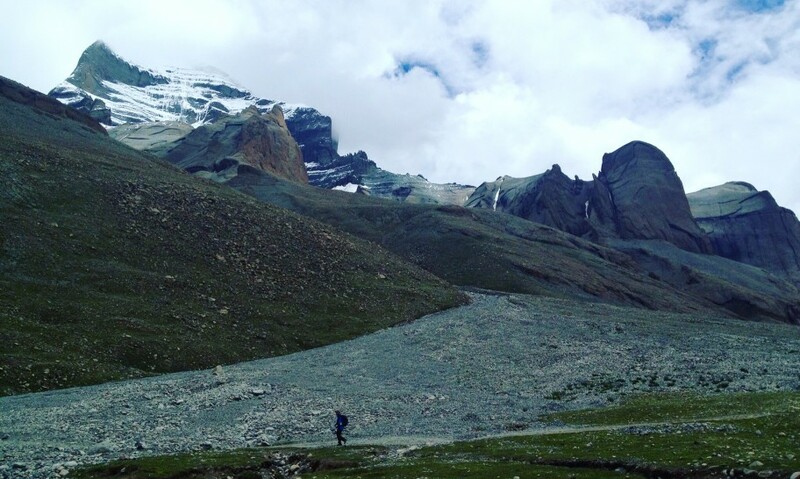 Kailash from the Horchu. We will make the parikrama of the Lake Manas today by community bus and overnight stay at Chiu Gompa/ Manasarovar guest house. Today we will take the holy bath at Manasarovar, do the pooja and Hawana. After lunch we will drive to Darchen. 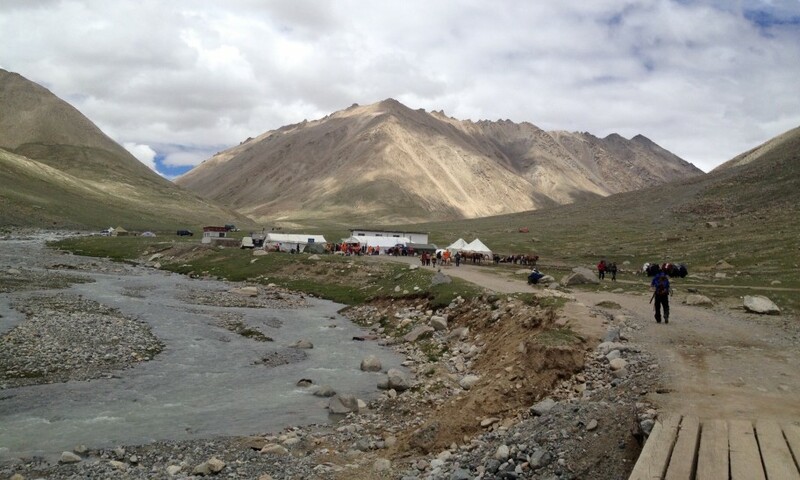 Final confirmation for the parikrama as we need to arrange horse and porters. Overnight in Guesthouse. Today is the first day of the Parikrama of the Holy Kailash (Kang Rinpoche). We drive to Darpoche, and then we start walking from here. We visit Yamadwar and Darpoche (the place for the Saga Dawa festival) where we can do the first prostration. The trail goes on the side of Sutlej River. Overnight stay in guest house at Diraphuk. Very special day of the trip that we will go over the Drolma-la pass (5630m), offer Prayers at the Drolma La and descend down towards the Gaurikunda. Walk straight down following the rocky gully to Sabje Dadok and we reach at the valley which is gradually goes down and we reach to Zhutulphuk. Overnight in Guest house. After 3 hour trek we reach at Jhongdu where the bus will be waiting for us and continue drive to Horchu by the community bus. Today is most special day which we complete the parikrama of both Mt. Kailash(Kang Rinpoche) and Lake Manasarovar. Then we continue drive to New Dongba. Overnight in guest house. Drive along the Brahmaputra river by saga town. We drive accross the vast tibetan plateau then descend after Lalung la pass to Nyalam. Overnight in Hotel. Early morning we drive to Kodari and after the custom formalities then drive to Kathmandu. Overnight in Hotel. Day 13 Departure back to Home. We will transfer you to the kathmandu international airport for your departure flight back to home. Sleeping bag (down), rated to -10 degree centigrade (If you don’t have them it can rent in Kathmandu for your trek period). Hiking boots should be light weight to medium weight leather or Gore-Tex. Your boots should fit well and be completely broken in prior to your trek. Two (2) good quality 1 liter water bottles. Toilet kit with towel, washcloth, bandanna, scrub brush, short clothes line, safety pins, mesh laundry bag, biodegradable soap, toilet paper, pre-moistened towel, toothbrush, toothpaste, etc. Personal medical/first aid kit with aspirin, ibuprofen or acetaminophen, nasal/throat decongestant, topical antiseptic, band-aids/bandages, sunscreen and lip balm, laxative, anti-diarrhea medicines, antacid, water purification tablets (or filter), moleskin, bug repellent, and any personal prescriptions or medical items. 01. As per new rules trip booking should be done in advance of 2 months prior to trip departure date with deposits of INRS 10,000 per person or US$ 200/ person. 02. 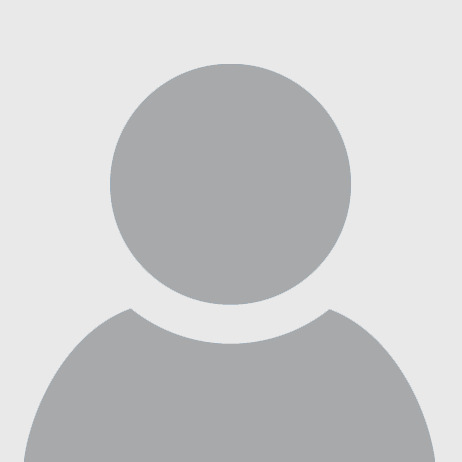 Minimum 6 months valid date passport is required and two copies of pp size photograph. 03. A normal health certificate from your personal doctor to those are 50 years and above by age. 04. Visas of Yatris who are above 70 years may be rejected by the Chinese Authority if using Indian passport. 05. 30 days prior to tour departure date, 50% of the total cost should reach Best Nepal Trekking (P) LTD. account by bank transfer with color passport copy of clients. 06. Full payment should make before departure to Kailash Manasarovar Yatra. 07. One group leader complimentary trip for a minimum of 15 paying pax. 01. All notice of cancellation must be sent to our office in writing. 02. 30 days before trip departure 10% of total trip cost. 03. 15 days before trip departure 25% of total trip cost. 04. 3 days before trip departure 50% of total trip cost. 05. Once clients arrived in Kathmandu thereafter no refund will be made.